Clearance Of All Stock, Available While Quantities Last. 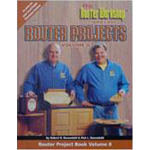 Bob and Rick Rosendahl have co-authored a number of project books featuring items shown on the past series "the Router Workshop". 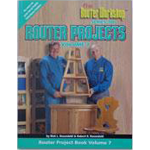 This listing also includes an early publication from Bob Rosendahl "The Router" and "Router Projects & Jigs" by Bob and Rick Rosendahl. 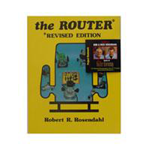 Co-authored by the router seminar experts, Bob and Rick Rosendahl. 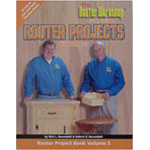 Each project is clearly itemized under material list, router tools, router bits, hardware use and procedures. 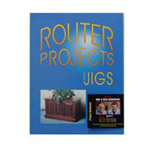 Plans for shop made jigs are offered where applicable. 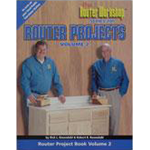 This book by Bob Rosendahl covers router setups, safety, bits, table mounting, pattern work, detail molding, inlays, panel doors, mitre work, circles, box joints, dovetails & more! Featuring all of the projects from Series 200 of "the Router Workshop"
Click Here to see full color pictures of these projects. 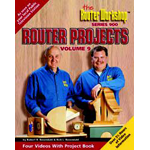 Featuring all of the projects from Series 300 of "the Router Workshop"
Featuring all of the projects from Series 700 of "the Router Workshop"
Featuring all of the projects from Series 800 of "the Router Workshop"
Featuring all of the projects from Series 900 of "the Router Workshop"
Legal Disclaimer & Internet Policy - © Copyright 2001 - 2019 Oak Park Enterprises, Ltd.